Welcome to my first kit “living” review, the new Swiftech H220 kit planned for release in late February. 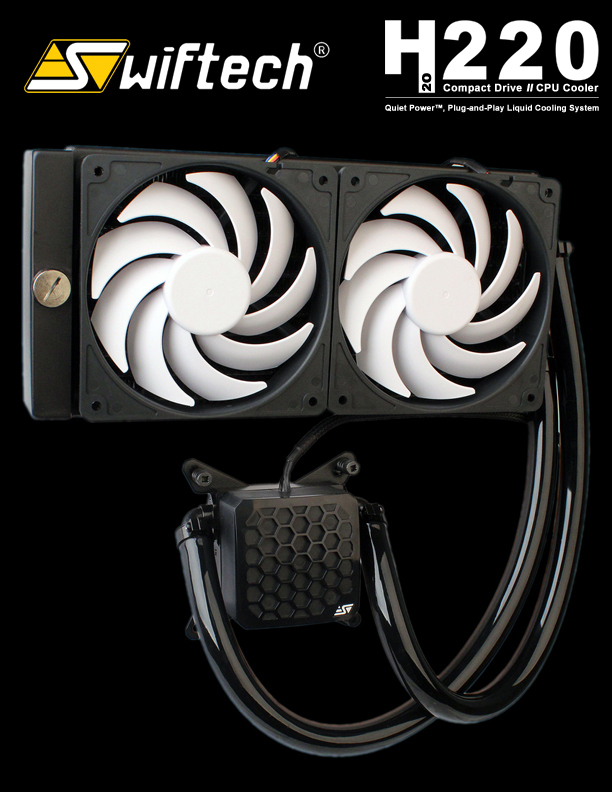 This is a rather unique product to water cooling as it is squarely aimed at combining the benefits of prefilled plug and play sealed kits and the expandable custom or DIY water cooling kits. While Swiftech has been in the DIY or custom kit business for some time via several innovative integrated options such as the H2O-X20 Edge, Elite, and separate component Ultima HD series, these kits are premium priced and require users to assemble and fill them prior to use which can be intimidating for new users. With the watercooling market filling with new users every day, many have been opting for the sealed systems such as the Corsair H100 or Thermaltake Water series due to their low price point and easy filled at the factory plug and play use. Unfortunately those systems are sealed not intended for expansion beyond the basic CPU cooler. That’s where the Swiftech H220 comes in and as far as I know, the only system under $150 that comes already filled and plug and play in addition to being something intended for expansion. This review will be the “Living” format in that I plan to release data and adjust my review and testing based on feedback I get through the comments. Please comment if you have any wishes of the review and test format. Long Beach, CA January 3rd, 2013 13:53 PST – Rouchon Industries Inc., dba Swiftech® is proud to announce the imminent release of the H220 CPU cooling kit, a new all-in-one liquid cooling system compatible with all current Intel® and AMD® desktop processors that will ship to consumers already pre-filled for plug-and-play operations. Setting itself apart from similar offerings, the product will also feature full expansion capabilities to include additional cooling devices for graphics and or chipset. The H220 will be unveiled during the Consumer Electronics Show held from January 8th to 11th in Las Vegas, NV and Swiftech® will demonstrate several systems featuring the new cooler capabilities at the Mandalay Bay Hotel Penthouse suites. In a related announcement, the company disclosed that they had successfully developed and begun high-volume manufacturing of a new generation of Swiftech-made mini-pumps, specifically designed for the liquid cooling market. The pump combines a compact design, high-reliability (60,000 hours MTBF) and the high head-pressure performance characteristics necessary to drive multiple devices in the same cooling loop. 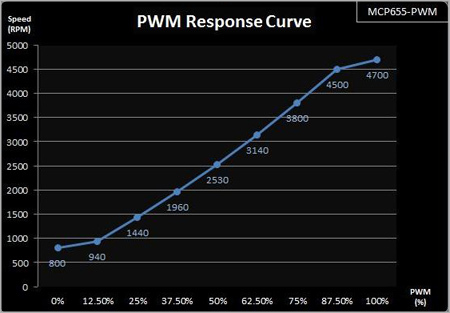 Being PWM controlled, the device can be driven by any motherboard like a regular CPU fan. Thanks to this new pump and to substantial economies of scale, the company claims that their new H220 CPU cooler will offer thermal performance with a low to inaudible acoustic signature rivaling that of the best custom kits, all at the price of an entry-level product. In the words of Gabe Rouchon, the company’s Chairman and CTA, “This thing is ridiculously quiet; if the chassis light wasn’t on, I couldn’t even tell the system was running”. Mr Rouchon also stated: “User convenience and the vast movement of novice builders towards liquid cooling was a critical consideration in the H220 design. It dictated that the kit would be pre-filled and completely plug-and-play. As a result, tuning and operations are as simple as using a regular CPU cooler. But with a 15 year heritage serving the enthusiast community, we also wanted to eliminate some of the limitations of the existing low-cost systems which are unable to accommodate add-on components because (a) they are sealed-up and offer no means to refill the system without voiding the warranty, and (b) the type of pump they use is not adequate to drive sufficient flow to cool more than a CPU. The Swiftech® H220 kit addresses both issues by featuring a reservoir with fill-port built into the radiator so that the system can be easily emptied or refilled by the user at will, and by our new high-pressure pump. It all seems that 15 years of innovation and know-how, together with some of the most extensive R&D we ever conducted have led us to this moment, and we are truly proud to present a solution that finally bridges the gap between full custom and sealed-up liquid cooling kits”. What stands out to me as the critical spec above is the 60,000 hour MTBF of the pump, this means the pump (The one wearing part) is designed to operate 24/7 for 6.8 years. If you have been around in the forums, many of the lower cost kits do see problems from time to time and it’s usually the pump that becomes the problem. 60K is even higher than most of the premium DIY/Custom pumps out there (Typically 50K), so my hat is off to Swiftech for being able to specify a pump MTBF rating that high and that’s important to keep in mind when buying the economical kits. If a pump out there doesn’t come with a MTBF rating, you just don’t know what to expect. It could last a few years or it could last only a few months before failing. While I have generally had good luck with pumps lasting, most of the pumps I have used long-term were rated at 50,000 MTBF hours. Only time will tell for sure, but I really like the specification. The other parts in the kit I know fairly well from the DIY/Custom side of things. The radiator core is an MCR220 QP and the fans are the Helix PWM. Also the copper base in integrated pump/block comes from the Apogee Drive II design. All in all, a very nice specification package and clever idea to make the kit already filled and plug and play.